Timber sash windows a common site throughout English villages, towns and cities. There is no denying that they are both beautiful and elegant to look at. Original sash windows have aesthetic attributes. These types of windows are specially handcrafted in original timber. Keeping with this taditional method helps keep you property look charming. The word ‘sash’ refers to a single frame for glazing. 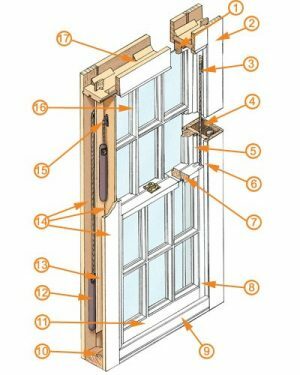 A traditional ‘sliding sash’ windows is most commonly made up of two sashes that slide up and down. They slide one in front of the other in vertical grooves, these are then counter balanced using lead weights on cords. Sliding sash windows can be opened from either the top or the bottom of the window. The glazed area of the window consists of small panels which are held together using glazing bars. The number of glass panes all depends on the era: ‘two over to’ is typically Victoria times. ‘six over six’ is usually Georgian, these are the most common types of sash windows that are installed. 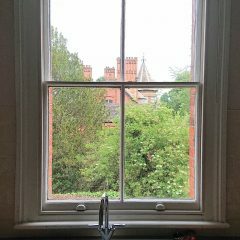 Sash windows that are being installed for historical properties should, be chosen carefully to ensure that the windows match the correct period. This is because there where several style and developments changes throughout the years. If your living in a conservation area or a listed building which is under restoration, genuine timer sash windows may be your only choice. Where ever possible timber sash windows should be repaired. If your windows are beyond repair, then we can get authentic replacements manufactured. Wood is extremely durable and is also an excellent insulator. If they are taken care of properly they can last longer then modern uPVC varieties. Timber sash windows don’t have to be high maintenance, this is because of the modern finishes that are available today. Whats the cost of sash windows? The cost of having your sash windows replaced all depends on the age of the property and whether you live in a conservation area. You also have to take into account the size of the window and the configuration of the frames and glazing. For a free no obligation quotation please Contact Us now. Top Rail:The top horizontal framing member of a sash. Rabbeted on the outside. Box Frame:Sometimes referred to as a ‘jamb’, the main box frame consists of three timber linings. Sash Cord:Runs over the pulley wheel and holds the weights. It can be bought in rolls when it needs replacing. Chains are an alternative. Weight Pocket:The weights hang in the pockets created by the timber linings on each side of the window. Insulation can be retrofitted in the pockets of older windows. Parting Bead:A long, narrow vertical seal that fits in the box frame to form separate channels for the upper and lower sashes to run in, and holds the top sash in place. Newer beads often have built-in draught seals. On the upper sash, the bead is fitted facing inwards; on the lower sash it faces outwards. The fit should be snug to prevent heat loss. Staff Bead: A moulded piece of timber made up of four sections, nailed all around the box frame, which aids airtightness and also holds the bottom sash in place. The staff bead is removable, but rarely salvageable, for the maintenance of the sashes. Meeting Rails:The horizontal framing members which meet the two sashes together in the middle. Their adjoining faces are bevelled so they close together tightly. Stile:Vertical side framing member of a sash — there is one each side. Apron:A decorative panel or cladding beneath the window. Cill:A horizontal board fitted internally at the base of the sashes. Shaped so that water flows away outside. Bottom Rail:The bottom horizontal framing member of a sash. Weight:A pair of lead weights hung on the sash cord counterbalance each sliding sash. The sash and weights must weigh the same. Wag Tail:A strip of timber inside the box frame that separates the weights. Also known as a ‘parting slip’. Timber Linings:The sections that form the casings of the box frame – which must be hollow to house the weights – are made in three parts: the ‘outer’, ‘inner’ and ‘pulley’ linings. Pulley Wheel:A pulley mortised into the top of the pulley lining; the sash cord passes over it to counterbalance the weights. Cheaper pulleys have plain axles; better quality ones are made with roller or ball bearings. Glazing Bar:A vertical or horizontal framing member that divides the panes within the stiles and rails. Each is rabbeted – a cut which forms a groove – to hold the single-paned glazing. The Georgian sash window has ‘six over six’ panes, but other configurations were seen over time, such as Victorian sash windows which have a ‘two over two’ panes. Soffit Lining:The window’s head is made up of the main inner and outer timber linings as well as a separate soffit lining; glued triangular blocks provide strength.